Are ants preparing for a war against humans? No. Not exactly. They don’t even know about us. Ants are just doing what any other species would do: seek out new territory, exploit resources, reproduce, and defend their family. But we have got to stop them, and it’s all out chemical warfare! There are no arms limitation treaties and no Homeland Security Office–each citizen is on their own. Imported fire ants did not intend to invade the US–they were accidentally introduced in 1918 in a cargo ship from South America–to them, it looked as good as any other place to make a living, maybe better. Who can blame them. Still, it was illegal entry, and since then, they have been multiplying and steadily extending their range westward, just like we would do. Stopping them has become a multi-billion dollar defense industry. 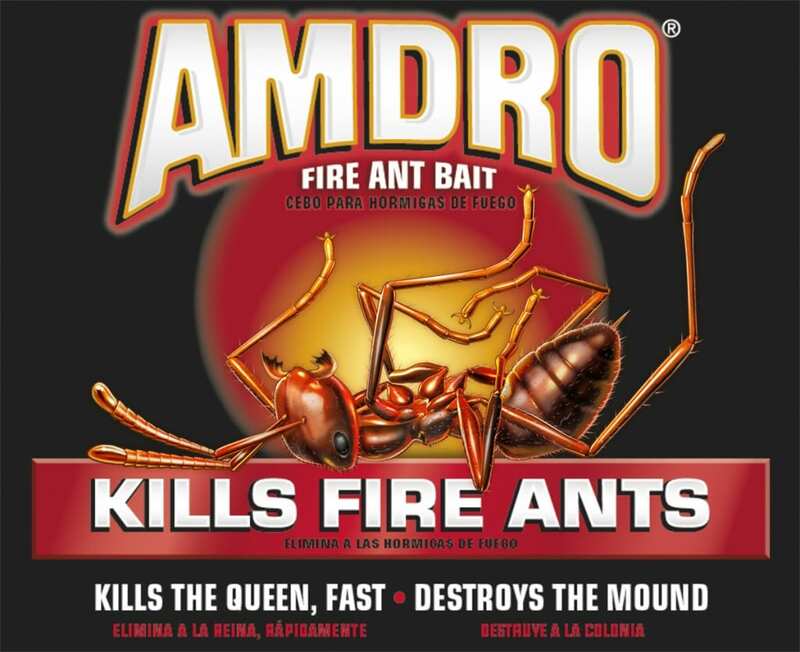 Then there is the sort of a mini-war going on in the ant-killer industry to gain market share in this war. This war is being fought in the hearts and minds of consumers and the standard-bearer is the packaging label. And on the home front, as the battle for market share in weapons of insect destruction has escalated, the packaging has evolved in kind. It is easy to see where the art is going: pretty soon the ants would no longer be recognizable as fire ants, or even like any kind of ant at all. They were looking like insects alright, but in the arms race to depict the enemy in as threatening a pose as possible, they looked more like the arthropod that ate Chicago in an old Japanese Sci-fi movie. When branding designer Ron Rifkin entered this fray, he decided to outflank the competition. Most of the competition’s ants looked pretty scary, but were not very realistic. He wanted a realistic ant, but he also wanted to make it mean. When Ron called me to do the new label illustration, he wanted to change the course of evolution a bit. Alex had already brought on board entomologist and insect photographer Alex Wild as a reality consultant. As great as Alex’s ant photographs are, this was clearly a job for illustration. They wanted two things: a super-real ant that was accurate and recognizable as genus Solenopsis, the fire ant. They also wanted it threatening. So we exaggerated some of the anatomy, like the mandibles. 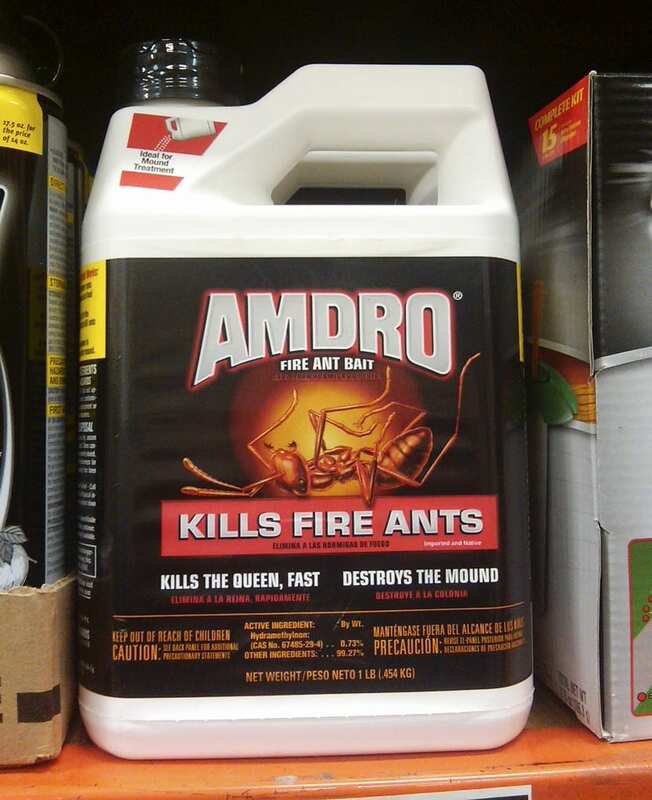 On this label, humans and ants would face each other, ready for the final battle. 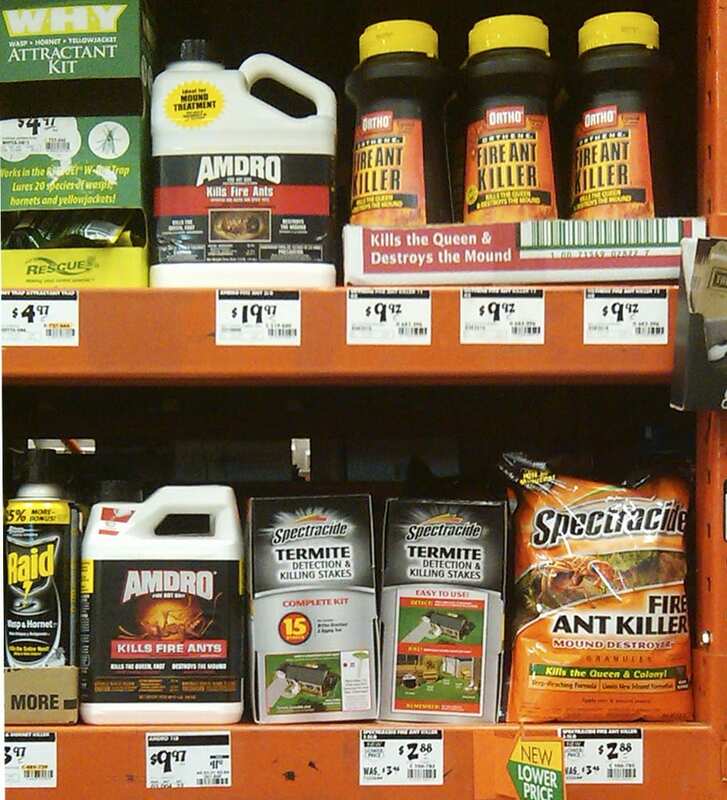 When the terrified consumer who had encountered the advance guard of the horde of invading fire ants from the east in their lawn, and raced to Home Depot to choose their weapon, and were standing, adrenaline pumping through their veins, in front of the display–what should they be thinking? And if they had paid attention in high school biology and were thinking strategically, “kill the queen.” It does no good to kill the ants you can see, no matter how high the body count. With this in mind, I went down to Home Depot myself and took some photos of the shelves with all the competing brands. I did notice that some of the other brands were almost sold out, while our brand was still there, packing the shelves. An employee even asked me if she could help while I stood there pondering. I told her I had things under control. During the illustration process, which is one of going back and forth, of sketching and painting new versions, the ant went from rough sketch, to cute ant, to smiling ant, to wickedly smiling ant, to looking like a Harvester ant. Realizing that harvester ants and fire ants were in the same subfamily, it didn’t take long to correct that error. But Wait! Hold the press. Word came in after I had marked this project completed that the client decided to do one more focus group based on a request from a CEO. 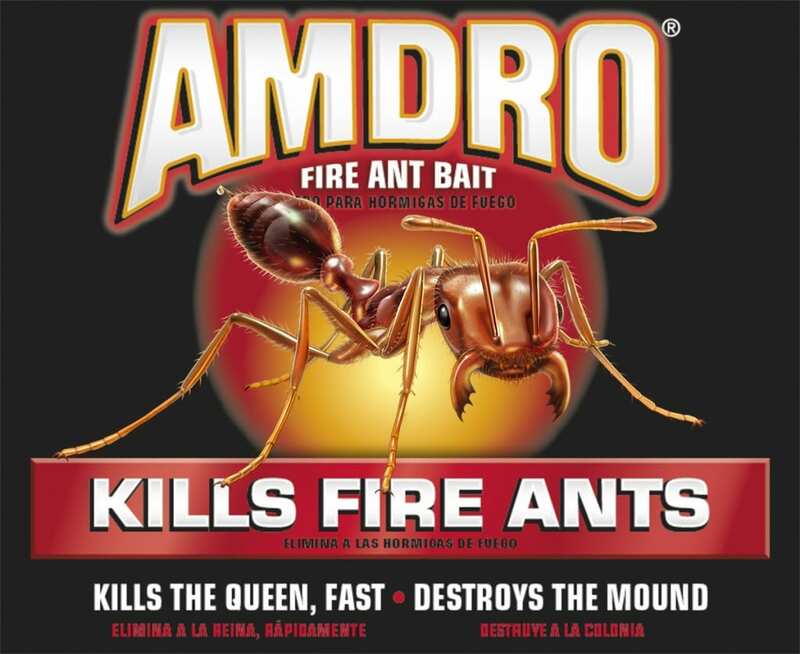 This time the ant would not be threatening–it would already be uh….dead. I did a colored comp of a dead ant for the market research team to test. There had been an overall increase in positive interest in the product based on the new design vs. the old one, but now the dead ant won over the live one by almost 2:1. I’m not sure what this says about human buying psychology. Maybe the satisfaction of seeing the enemy already defeated trumps the adrenaline rush of seeing him (or her, in this case) attacking. Here is the final label.